When opening TexTools for the first time, the application will try to automatically detect the install location of the game. Note If it cannot find your directory, or you chose not to use the directory it found. You will be asked to locate and select your ffxiv folder. Once you’ve clicked on Yes, or selected your ffxiv folder, the application will open. The items obtained from the game files will appear in a categorized list, and in alphabetical order. Typing more than 3 letters in the search box will automatically start to filter the list. 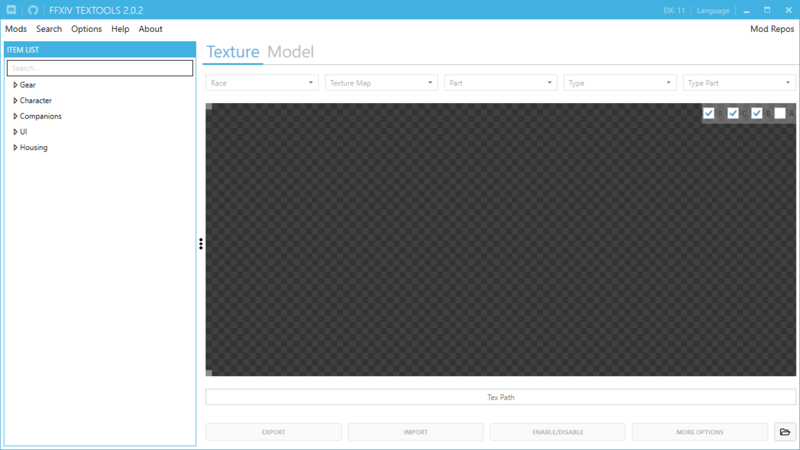 Use the drop-down menu to select a texture map to view. It will have all available textures for the selected item, and the items icon if it is available. Note Drop-downs will be disabled if there is only one item in them. Color channels can be changed with the checkboxes on the top right hand corner of the view. This is very useful since the game uses Channel Packing for its textures. Use the drop-down menus to select from the list of available Races and Meshes available for that item. Note If a race is not on the list, it shares the model with another race. Most male races uses Hyur Midlander Male model. Most female races use Hyur Midlander Female model. The model viewer offers a full range of motion to view the model inside and out. This will reapply the texture on the model, mostly useful after the texture has been updated and you want to see the difference on the model. You may enable, disable, or delete the mods or mod packs directly from this list. If the mod has a green border it is Enabled. If the mod has a red border it is Disabled. ModPacks Create ModPack and Import ModPacks are discussed in their own tutorial. Disable All Mods – Disables all the currently active mods. Enable All Mods – Enables all mods that are in the ModList. You can change the default directories, colors, race, and export settings. This will check for the most common issues when something goes wrong, and suggest a fix if it finds anything. Start Over – This is like a “Restart” button. All mods are removed, and files cleaned. Report Bug – This will take you to the Bug Reporting website, you may also leave suggestions. Back Up Index Files – Manually create a backup of your index files. This window shows information about TexTools, including the current version and a link to the website. You can switch between different languages for the application here. Note Changing the Language requires the application to restart. Not everything is translated, if you'd like to help with translation let me know. This links to the two most common repositories of mods for the game. You can click on DX Version on the top right to change between DX9 and DX11 versions of textures. DX9 and DX11 Versions do not make a difference for anything else.